Rublev Colours Lead White (also known as flake white or Cremnitz white) is an opaque white that is smooth and brushes long in the direction of the brushstroke. The consistency straight out of the tube is creamy, slightly ropey yet retains its shape as you manipulate it while being soft yet sculptural. Our lead white is made with pale linseed oil and basic lead carbonate (made according to modern processes) without stearates or fillers to alter the characteristics of the pigment. As a result you get higher pigment volume concentration (PVC) than other brands of lead white (flake white)—as high as 50%. This means most brands of flake white do not weigh nearly as much as Rublev Colours 50 ml tube. Yet, Rublev Colours Lead White is not overly stiff and mixes well with all other oil colors. 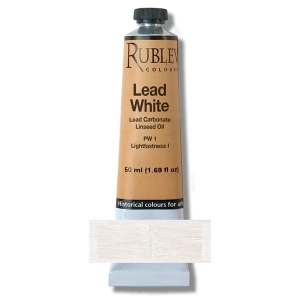 Lead white is the most common white found on the old masters' palette. Lead pigments have been made artificially since Antiquity, although health concerns of lead poisoning has greatly diminished its role in paint today. Drawdown Note: The scan of the "drawdown" (left) contains a pre-mixed paint film of 6 mil (0.006 inch) thickness applied to a standard test card for the purposes of examining color consistency, opacity and other qualities. The drawdowns show the color full strength (mass tone), on the left, and mixed in a 1:2 ratio with titanium white on the right. The bottom area of the drawdowns are scraped to show undertones. Swatch Note: Colors swatches are shown in mass tone, straight from the tube, on the left, and mixed with an equal amount of white on the right. All pictures of color swatches in this web site are only approximations of the actual color of the oil paint. We have taken every care to match the color in these pictures on calibrated color monitors to the actual color. However, because of the wide variance in color monitors the results you get may vary. Note: Some separation of pigment and oil may occur in Rublev Colours Artists' Oils and is a natural process when no stabilizers are added to paint to prevent this from occurring. DANGER! CONTAINS LEAD. HARMFUL IF SWALLOWED. Avoid ingestion and skin contact. Wear protective clothing and gloves to prevent contact with skin. Never use near children or pets. Conforms to ASTM D 4236. Must be used exclusively as material for the purposes of arts, crafts or hobbies, not for use by children. Utiliser uniquement aux fins suivantes comme matériaux pour les besoins d'art, d'artisanat ou passe-temps, pas pour une utilisation par les enfants. Click here for the Safety Data SheetCalifornia Proposition 65: This product contains a chemical known to the State of California to cause cancer and birth defects or other reproductive harm.